Cast: Kimura Takuya, Tsutsumi Shinichi, Ayase Haruka, Suzuki Kosuke and Bengaru. Five years after being transferred from the Josai branch, Kuryu Kohei (Kimura Takuya) is relocated to Yamaguchi: a town that is practically owned by the Kimura family. In the office he is put together with a paralegal who’s not only uptight, but is called a ‘weirdo’ by his coworkers as he rarely does anything that can be called social. 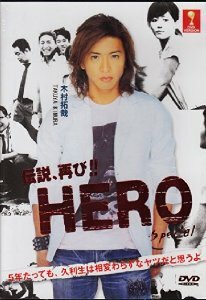 When a murder occurs in small town Yamaguchi, people are shocked to find out that the towns favorite Takida is arrested. Takida works for the Kimura family, and is liked by people more than the son of the founder. So everyone in the office refuse to take on the case as they most defiantly will be hated by the towns people for prosecuting him. The case is eventually given to Kuryu and as thorough as he is he decides to look at the case from every single angle..
Hmm, I liked it better than the drama, but that is only because they kept the originality yet had it be quite more ‘modern’. I was worried that I would be bored since the other actors weren’t there but it kind of refreshed everything and made it quite funny. Though I didn’t expect that kind of outcome of the SP, I have to admit I was entertained most of the time. So kind of worth it, and if you have watched the drama, the SP is kind of a must in this. All in all, quite good.